Secretary of State John Kerry is expected to name Martin Indyk as the U.S. Representative to the Israel-Palestinian peace negotiation. Indyk has been around this peace talk track before. He belongs to a small group of Jewish diplomats who have specialized in Middle East negotiations. The same names come up with every new effort to reconcile Israel and the Palestinian Authority. This time the key player is Indyk. Who is he? 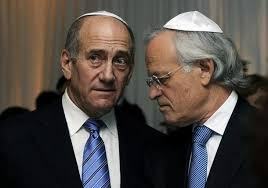 Indyk (shown above at right with former Israeli Prime Minister Ehud Olmert) began his Washington career as an AIPAC staffer, served as executive director of an AIPAC think tank offshoot, the Washington Institute of Near East Policy, and then served two short terms as the first foreign-born U.S. Ambassador to Israel. Indyk was born to a Jewish family in London, England. The family moved to Australia where Indyk grew up in the Sydney suburb of Castlecrag. He graduated from the University of Sydney in 1972. He received his PhD in international relations from the Australian National University in 1977. Indyk imigrated to the United States and later gained American citizenship in 1993. While former Palestinian negotiator Nabil Shaath said that Indyk was “partial, biased, pro-Israel” and defended Israeli settlements more than Israelis. And this is the man in whom we are to place our trust as Kerry’s point man for peace? When Kerry was engaged in his recent travels to the region, he tried to make the case that this set of negotiations would be the final opportunity to bring the two opposing sides together. Now the news from Palestine is that President Mahmoud Abbas is satisfied that Kerry and Indyk will be fair in reaching an agreement. How could Abbas possibly reach such a conclusion? There is nothing emanating from the Israeli side that would suggest that Benjamin Netanyahu can bring his right-wing government to accept a peace agreement anywhere near any reasonable position of fairness. Is the Palestinian Authority president placing his trust in the upcoming negotiations because of specific promises? Word from Israel is that it is prepared to release some longtime Palestinian political prisoners, many of whom Israel classifies as “heavyweights”, whatever that could possibly mean. Kerry has also dropped hints of financial incentives to the PA from outside investors who are eager to invest in the Palestinian economy. That is the old “investment not divestment” trope which has been a part of Protestant church discussions in recent years. It sounds nice but where is the meat? Where are the roadblocks opening up; where are the tough decisions on Israel’s illegal settlements? They’ll supposedly be getting 100 freed Palestinian prisoners held in Israeli jails for decades. The Israel Broadcasting Authority says the prisoner release would happen in four stages and the first one would only happen during the second month of negotiations. A lot can happen in that time. And I’d say a guarantee of this happening is pretty thin. Further, the Palestinians seem willing to overlook that Israel, after past prisoner exchanges, promptly rearrested whoever it still wants behind bars. In these negotiation promises, there is not a single sign that oppression will be eased. Psalm 146:3 comes to mind: “Do not put your trust in princes” (NIV). It would be wrong to believe that this new round of talks brings with them the slightest hope of success, if our only hope rests with U.S. political leaders who have thus far forfeited their leadership to the Zionist Lobby. Which is why the real effort on the part of progressives in and out of religious communities, must be to persuade the American public that our only hope for peace in the region is in our ability to put pressure on U.S. political decision makers, from the White House to the Congress and out to the media. Which is why this could be the right moment to enlist retired military leaders in the cause of peace. These are the front line leaders who are strongly in favor of negotiations that really succeed. The military generals who must work in the US Central Command are closer to the situation on the ground than diplomats visiting from outside. 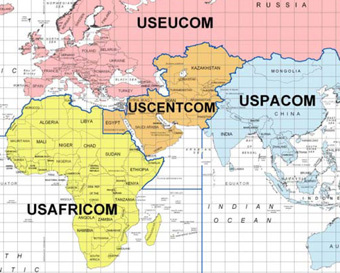 This map of the different U.S. Central Commands show the Central Command stretching from Afghanistan into north Africa. Recently retired US Central Commander General James Mattis warned . . . that if Secretary of State John Kerry’s attempts to broker a deal between Israel and the Palestinian Authority failed, Israel would be exposed as an apartheid state. Mattis pointed at the settlement enterprise as the source of Israel’s diplomatic crisis, declaring that “the protagonists” – Israel and the Palestinian Authority – might not be as interested in a deal as Kerry is. Mattis’ warning follows an earlier warning issued by Israeli negotiator Tzipi Livni,who warned that Israel is in danger of a worldwide boycott if current negotiations fail. General James Mattis spoke at the Aspen Institute’s annual Security Forum, in Colorado. He was far more direct than political leaders dare to be. Mattis said that as a result of Israeli intransigence and the US special relationship with Israel, he and his troops have “paid a military security price.” His comments echoed those of his predecessor, General David Petraeus, who told the Senate Armed Service Committee in 2010 that “enduring hostilities between Israel and some of its neighbors” had damaged US interests in the region. Petraeus was hammered by pro-Israel forces for his remarks – Abe Foxman called him “dangerous” — and wound up walking them back. Mattis, a 45-year military veteran, ended his assignment at CENTCOM on June 1. He appears to be speaking without much concern for domestic political pressure. The Abe Foxmans of U.S. domestic politics do not seem to trouble him. We no longer have a significant and progressive ally on the media front at a time when a second term Obama administration shows signs of fatigue and what is worse, an unwillingness to defy Israeli demands. Progressives worldwide are mourning the death of longtime journalist Helen Thomas, who died July 20 at age 92, in Washington. She threw hard questions at every president from John F. Kennedy to Barack Obama. Thomas routinely questioned White House officials over U.S. policies toward Israel and the Middle East, which led some to complain she was too sympathetic to Palestinian and Arab viewpoints. Bush spokesman Tony Snow once famously answered one of her questions with, “Thank you for the Hezbollah view”. At a time when US news media confined most female journalists to writing about cookery, fashion and “women’s interests”, Helen Thomas was one of the doughtiest warriors to storm the absurd barricade. Thomas, who has died aged 92, became a national icon as the senior correspondent at the White House for United Press International (UPI), with the privilege of saying to US leaders from John F Kennedy onwards, “Thank you, Mr President”, signalling that the press (and the television audience) had heard quite enough. She was so hard on George W. Bush that he shut her out of his press conferences, refusing for three years to call on her for a question. When Barack Obama became president, he called on her during his first White House press conference, acknowledging that it was a risk. He was not disappointed. After three years of enforced silence, Thomas asked the new president about Israel’s nuclear arsenal, a topic which by tacit agreement is off limits to media and politicians. The policy of “deliberate ambiguity” is followed, allowing Israel to keep their nukes a company secret. Meanwhile, Israel continues to make demands on other Middle East countries to reveal all regarding their efforts to build their own nuclear arsenal. Obama dodged the nuke question. The Post headline was descriptive: “Helen Thomas, feisty scourge of presidents, dies at 92″. She died just as the latest round of Israeli-Palestinian peace talks are launched with little chance of success. We need more “feisty scourges” like Helen Thomas in the White House press room.